Property 1: Luxury 5* villa with private pool amazing views, perfect for 2 or 4 guests. Property 4: Calmando. Enjoy some of the best oceanfront views Crown Point has to offer. Moondance Hideaway, Bequia. Where Angels come to rest. 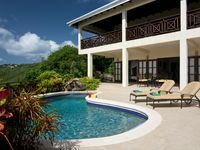 Property 9: Moondance Hideaway, Bequia. Where Angels come to rest. Ravenala House, Lower Bay, Named in The Times 50 best Villas in the Caribbean. Property 25: Ravenala House, Lower Bay, Named in The Times 50 best Villas in the Caribbean. Thank you Peter for allowing us to share your lovely home. Villa and it's location was beautiful. We enjoyed this three bedroom home with its wonderful views and quiet location. We fell in love with the Spring area. Even though you feel miles from everywhere you are only minutes from town with access to great beaches, lovely restaurants and resorts. We loved Bequia. A magnificent island with great people, food, nature and charm.